The capital structure arbitrage trade is, in theory, less risky than going outright long one security or the next. With that said, because a number of cap structure arbitrage strategies require leverage (via repo, TRS, etc) to hit firm's target IRRs, a trade going against you can be devastating. One of the more common capital structure trades seen in the market is long senior paper versus short subordinated paper. All else being equal, in very bullish times the difference between the spreads of the two bonds will be tighter than in very bearish times. This is because in bull markets, investors search and reach for yield thereby increasing demand for the more yieldy paper. One of the most common functions I use in Bloomberg is HS < go >. This function is dubbed the "Historical Spread Graph/Table" You can pull in two bonds and look at the difference in spread between the two (these can be any bonds...in fact you can pull in all sorts of statistics, but for this exercise we will focus on a select few). Below is a chart of the FDC's 9 7/8% of 2015 (Seniors) vs FDC 11.25% of 2016 (sub) over the past year. The top part of the chart lays out the spread to treasury of each of the bonds with the bottom chart showing the difference between the two. 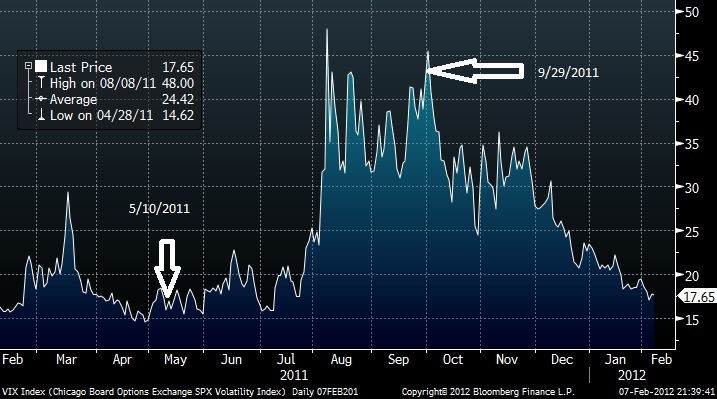 The above chart is a chart of the VIX over the same time period. As you can see when markets are bulled up (i.e. VIX is low), the spread differential between the senior and sub bonds are tight. When markets are bearish (i.e. 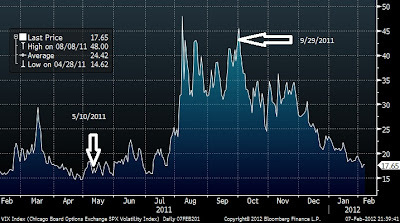 VIX is high), the spread differential between the senior and sub bonds are wide. The question then becomes: What is the right spread differential? Or better, what should be the intrinsic compensation and investor receives for taking on additional leverage and further subordination? There is a term in credit analysis: Spread per turn of leverage (or in some cases, yield per turn of leverage). If XYZ issuer has $100M of EBITDA, $200M of Senior Debt and $300M of Sub Debt (so $500M of total debt, with both notes maturing on the same day and trading at par), senior leverage would be 2.0x and sub or total leverage would be 5.0x. If the Senior Bonds were yielding 6% and the Sub Bonds yielding 10%, you would be receiving 300bps of yield per turn (6%/2.0x) and for the sub bonds you'd be receiving 200bps of yield per turn (10%/5.0x). All else being equal, the seniors would be a better value. But let's add a little bit of complexity to the issue. Let's say the business of XYZ is worth 10x EBITDA. In that case, in a simple world, the recovery on both bonds would be par+. Then wouldn't the subs be better value? You are picking 400 bps for the same recovery. With that said, determining the recovery rate of each security becomes fundamental to determining if yield / spread differentials are appropriate. The situation dramatically changes when one layer of the capital structure is levered 2-3x and another is levered 8-9x. More leverage = more swings in recovery. If one bond is pricing in a recovery rate significantly different than you are calculating, this could create opportunities on either the long or the short side. And just to add a little more complexity (because this is getting fun): Depending on if the bond is trading above or below par changes the equation as well. This is more relevant for higher quality issuers, but if you have two pari bonds of the same issuer trading at 120 and 100 respectively, the bond trading at 120 will have a higher spread than the bond trading at par. Assume this issuer's recovery rate in a restructuring is 30 cents. If you buy the 120 bonds today, you stand to lose 90 points whereas if you buy the par bond, you stand to lose 70 points. You thus have $20 extra dollars at risk (Price bond 1-Price bond 2). 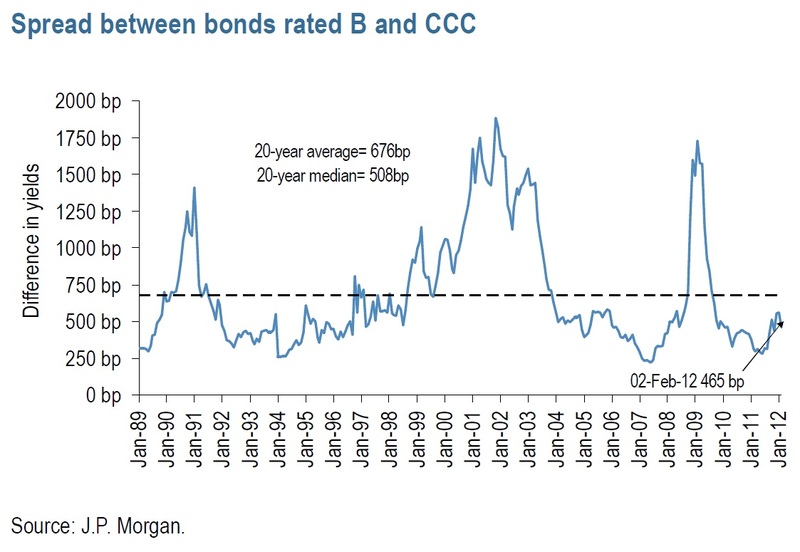 If the average spread on the bond is 300 bps, and our recovery rate is 30, the implied default rate = 9%. 9% * those 20 extra points at risk = 180bp of extra compensation needed. Lets say the 120 bond is trading 250 bps wide of the 100 bond. Well that would be an interesting opportunity that could be arbitraged by going long the 120 bond, and short the par bond. "...we don't undertake the tactical actions described above in response to what we or some economists think the future holds, but rather on the basis of what we see going on in the marketplace at the time. What things do we react to? The simplest signs surround valuation. What's the yield spread between high yield bonds and Treasurys? And between single-B and triple-C? What are the yields and premiums on convertibles? Are distressed senior loans trading at 60 cents on the dollar or 90? ..."
As you can see, in very bearish times (late 2008-mid 2009, as well as 2001-2003), this spread blows out. 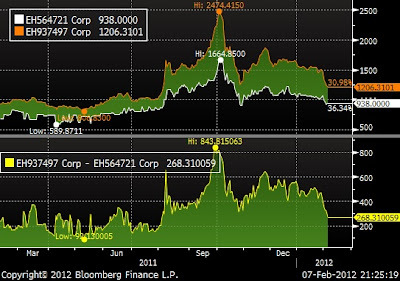 In bullish times the spread is smaller. 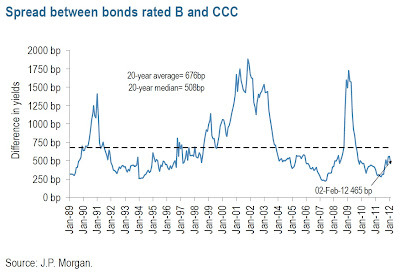 Currently at 465 bps versus a median of 508 bps, it stands the market is probably slightly overvalued (we have silently moved into the low 4s on my "risk pendulum scale"), which is not to say the market will not continue grinding higher - I just don't think you are getting compensated for taking that risk. Some strategists are starting to throw in the flag (Goldman Sachs just got marginally constructive on credit). Full capitulation which equates to bubble territory has not happened yet with still many parties on the sell side calling for a pull back which would have been blasphemy in 1Q 2011. Any books on the topic? How did you calculate the implied default rate=9%? this is a really good series. many fundamental credit analysts are too focused on individual tranches and fail to recognize the value/arbitrage between tranches (including myself). Same question on implied default rate. As quick approximation seems like it should be Spread/(1-Recovery Rate) = 4.3% ? Maybe a stupid question, but when I look at the debt offerings for a company on Bloomberg, is there an easy way to determine seniority in the structure beyond the obvious loan, bond, equity relationships? For FDC, if these are both bonds, how do you know which is senior? Thanks. also curious how you calculated the 9% default probability...i get something closer to 4%.